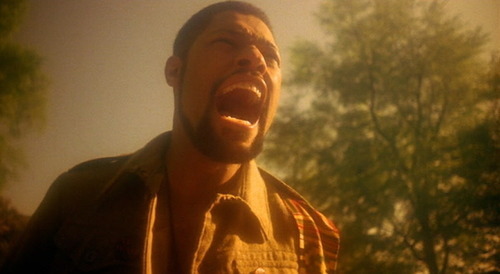 Laurence Fishburne yelling “Wake up!” at end of movie School Daze (1988), December 9, 2009. (screenshot via Tumblr.com). Qualifies as fair use due to low resolution of picture. Thirty years ago this weekend, I made a couple of decisions that I would take with me for the rest of my days of formal schooling, and still keep in mind for myself when I’m in the classroom as a professor. The decisions I made about my teachers came out of a sense of both malaise and desperation. You see, I was near the end of tenth grade in May ’85, and had figured out months earlier that I had hit the mediocre-and-apathetic-teacher-lottery at Mount Vernon High School that year. That my Humanities teachers were underwhelming shouldn’t have been a surprise, really. Yet it was. I’ve written here and in Boy @ The Window already about two teachers — Zini for history and Lewis for Chemistry — who either “got on my last nerves” or as an “unimaginative instructor” who lived in “a chain-smoking world.” But I also had an Italian teacher who lost his job in April because of the distractions of owning a car dealership, a Trig teacher who could screw up an equation for me faster than I could quip, “Yeah, right!,” and an English teacher in Carol Buckley who spent most our eighth periods together lying on a couch and asking us to water her plants! The best teacher I had that year was my keyboarding instructor, who spent most of the year congratulating the women in the class who came in typing sixty or ninety-five words per minute. It wasn’t all their fault. I was fifteen as well, more than a bit rebellious, as nearly every adult authority figure in my life had either abused or neglected me in some way. Yeah, maybe I did take my teenage angst, my lack of belonging, and my troubles at 616 with my Mom, my idiot ex-stepfather and my father Jimme out on them from time to time. I’m sure that’s true. It’s also true that I distracted myself with Humanities and school. I used that forty-two weeks out of each year to throw down academically, to work, to grind, to use my Jedi-mind tricks to take music and movies, arts and sports to absorb knowledge like Takeru Kobayashi and ‎Joey Chestnut at a hot dog eating competition. Those teachers, with their lack of nuance, or in some cases, actual lack of knowledge (and in at least one case, lack of teaching acumen), ruined my standard operating mode. 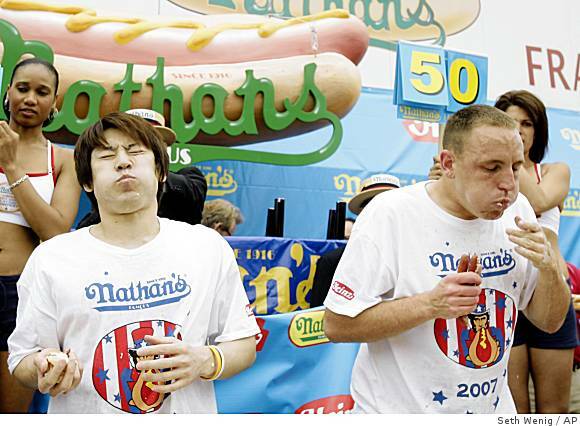 Takeru Kobayashi and Joey Chestnut battle it out at the 2007 Nathan’s Famous Fourth of July Hot Dog Eating Contest, Coney Island, Brooklyn, NY, July 4, 2007. (Seth Wenig/AP; http://philly.com). My Memorial Day Weekend ’85 decisions actually began in February. I decided after another week of watching Viggiano mess up another sine, cosine and tangent lecture that I needed to learn how to do Trig properly, which meant on my own. I went to Mount Vernon Public Library, checked out the best Trig textbook I could find, and began working on angles and equations whenever I could squeeze in a spare moment. I bought the Barron’s Trig Regents Exam test preparation book at the end of February, and started working on practice exams in April. It wasn’t until the week going into Memorial Day Weekend, though, that I had an epiphany about my tenth-grade teachers. Lewis made it so with yet another stream of nonsense. Lewis went as far as to say, “There’s nothing to worry about” on the subject of organic chemistry. “There will be hardly any organic chemistry on the exam, anyway,” he said. After eight months of listening to his blathering, I thought “That’s it! Whatever he says to do, I’m doing the opposite!” The next time I got money from Jimme, I went out and bought the Barron’s Chemistry Regents exam prep book. It was just before Memorial Day, and I had a month before the exam. That wasn’t all I decided and did. I really did think that my teachers were incompetent, lazy and arrogant. I simply could no longer trust them, even as I was desperate to trust someone at fifteen. I decided that ultimately, I was my own best teacher and own best barometer of what I needed to learn and why I needed to learn it. I decided that teachers had to earn my trust as a student, that I was no longer going to automatically entrust them with my educational enrichment, no questions asked. I decided that if I really was going to be going to college in a couple of years, that I had to keep my eyes open for individuals I could trust, because by the end of tenth grade, I didn’t trust Humanities as a program and MVHS as a school. Those decisions turned out to be good ones, even though it also meant few new friends and only a couple of mentors after tenth grade. Luckily there was Meltzer, luckily there was Martino, and luckily, I was only two years from graduating.